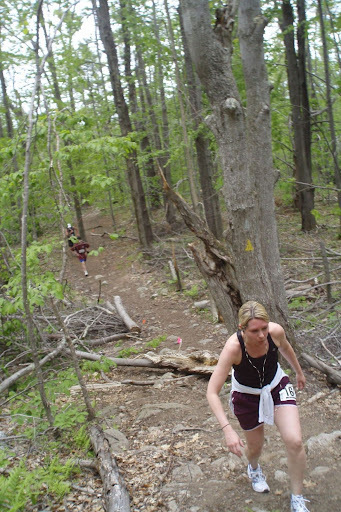 Wachusett is the first race in the USATF-NE Mountain/Trail Circuit (the “Mountain Goat” Series.) If you run all six races in the series, you get to bypass the Mt. Washington Lottery next year. In past years, this was a road race. You ran up a very steep road (aptly named "Mile Hill Road"), and then up the winding Auto Road to the summit of Mt. Wachusett. Steep...challenging...but pretty straightforward. Nothing technical. Just asphalt. This year, however, the auto road to the summit was closed for construction. So the race organizers came up with something new. We ran up Mile Hill Road, and then turned into the woods for several miles of trails. We never reached the summit...but we had a great run around the shoulder of the mountain.